My first Level 1 Certification was unsuccessful, but I'm still very happy with the results. 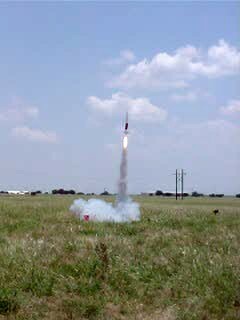 I flew the “Tethys Project 4” on an Aerotech H123 reloadable motor. A certification flight requires that you fly your rocket without damaging it. The boost section of the flight was picture perfect. Unfortunately, the nosecone and booster section collided during parachute deployment, damaging the booster section. The parachute tangled and while out, never fully opened. 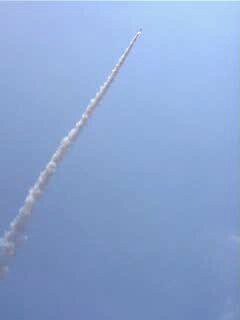 The rocket descended much quicker than desired, but suffered no damage on impact. While not getting my certification was disappointing, a lot of anxieties have been overcome. 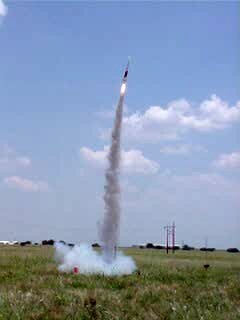 I had never built and flown a rocket of this size. It held together very well, even surviving a rather harsh landing. Also, I had never assembled and flown a reloadable motor before. I had fears of it blowing up or having a blow by fifty feet off the ground. Luckily, this didn't happen and I was very pleased with the flight. Earlier in the day, I flew the Aerotech Warthog on a G80-7T. Beautiful flight, but a lengthy walk on recovering the rocket.